This Glazed Salmon Recipe is dedicated to my nephew who is a fisherman in the deep, cold waters off Alaska. 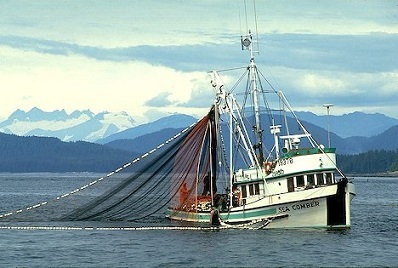 To him and all those brave souls who harvest wild seafood, including wild salmon, for our dining pleasure and our nutrition. 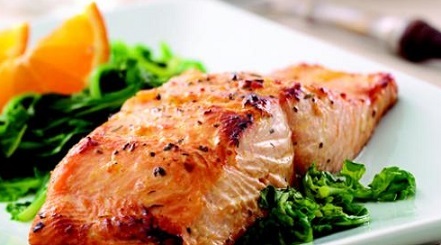 Fresh salmon steaks and fillets should be firm and deep, "salmon pink" in color. The meat should have a slight sheen and appear somewhat translucent. Choose steaks and fillets with smooth cuts. Cuts of salmon that have gaps or separation of muscle fibers are indicative of old fish. Refrain from salmon that has a strong "fishy" smell, the fish odor should be mild. Place salmon steak/fillet skin side up directly on grill grate. Cover. Grill steaks/fillets for a total of 4-6 minutes (2-3 minutes per side) per 1/2 inch thickness, turning only once. Salmon continues to cook after being removed from the grill. Cook salmon just until meat begins to change color and becomes flaky. To check the flakiness, insert the tip of a sharp knife near the bone or at the thickest part of the salmon and pull slightly. Place foil on sheet pan and oil lightly. 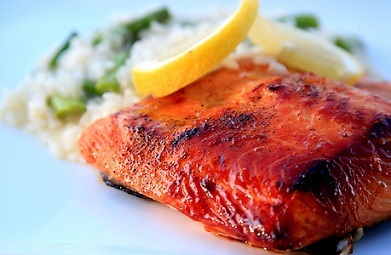 Place salmon on foil, brush with marinade, and place 3-4 inches under broiler. 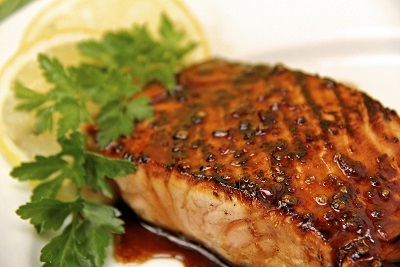 Brush with marinade at least 2 more times or until fish just begins to flake. Enjoy your glazed salmon recipe and the other restaurant recipes on the website and the company of those you share them with! With these recipes you can cook with confidence and style! Did you know? Wild salmon are “anadromous,” meaning most salmon are born in fresh water, migrate to the sea, and return to freshwater to reproduce, or "spawn."